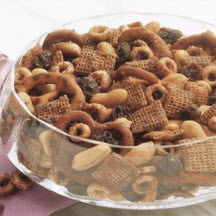 If the party hasn't started...it will when you bring out this tasty cocoa snack mix! Heat oven to 250°F (120°C). Combine cereals, peanuts, pretzels and raisins in large bowl. Combine melted butter, cocoa and sugar; stir into cereal mixture. Toss until ingredients are well coated. Pour mixture into 13 x 9 x 2-inch baking pan. Bake 1 hour, stirring every 15 minutes. Cool completely. Store in airtight container. Makes about 10 cups snack mix. MICROWAVE INSTRUCTIONS: Place butter in 4-quart microwave-safe bowl. Microwave at HIGH (100%) 1 minute or until melted; stir in sugar and cocoa. Add cereals, peanuts and pretzels; stir until well coated. Microwave at HIGH 3 minutes, stirring every minute; stir in raisins. Microwave at HIGH 3 additional minutes, stirring every minute. Cool completely. Store in airtight container. Makes about 10 cups snack mix.